In recent weeks, the Russian currency has fallen against the dollar while the price of oil has remained stable. This atypical situation has benefitted Russian energy companies – and the state treasury. The Russian economy has found itself in a fairly unusual situation in recent weeks: oil prices remain high, but the ruble has weakened in value against leading international currencies. This is a dream come true for oil exporters and the Russian treasury is likely to benefit from the increase in revenues. Ordinary consumers, however, will suddenly find goods imported from abroad more expensive. Traditionally, the ruble exchange rate has tracked the price of oil very closely, but over the past few months, the Russian national currency seems to have decoupled from oil. Economists at Bank of America Merrill Lynch say there is a risk of the oil prices dipping a bit in the second quarter. But for Q1 and Q4, the bank expects crude to remain expensive. The combination of cheap ruble and expensive oil is fairly unique. 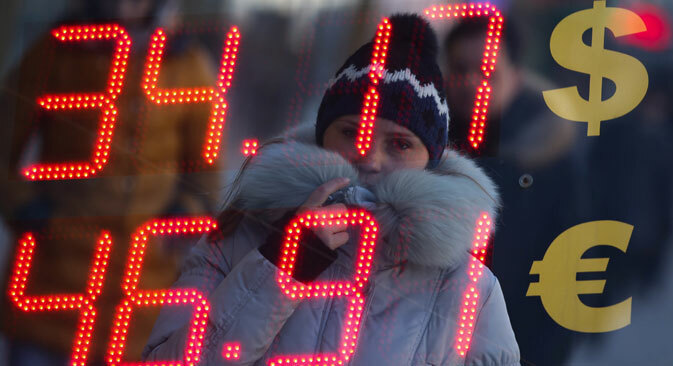 At the height of the 1998 and 2008-2009 economic crises, the situation was very different, said Mikhail Krylov, head of the analysis department at United Traders. In 1998, the dollar climbed a record 247 percent against the ruble, while Brent crude fell 33 percent to $12.76 dollars a barrel. In 2009, oil prices fell by 36 percent, and the ruble reached a new low of $36.73 to the dollar, Krylov said. A weaker national currency is always a boon for exporters – but a weak ruble combined with expensive oil is gift to Russia’s oil industry. “This is a great situation for the oil companies because they receive all their revenues in dollars, but pay their taxes in rubles,” Krylov said. “A fall in the ruble exchange rate translates into an almost equivalent rise in the oil exporters' profits because most of the taxes and duties they pay are a flat rate per barrel of crude, not a percentage of their revenues. This is why our projection for the fall in the ruble exchange rate and the rise in the oil exporters' profits is the same: about 12.7 percent." Bank of America Merrill Lynch analysts also said that the combination of cheap ruble and expensive oil is a strong argument in favor of investing in Surguzneftegas. Surgutneftegas has more to gain from the situation than state-owned Rosneft, which has a sizeable dollar-denominated debt, which means that the company has to buy a lot of dollars on the market once every several months, regardless of the exchange rate. Russian gas monopoly Gazprom is also among the winners thanks to its large exports – but the freezing of tariffs could dampen the effects of the falling ruble on the company’s bottom line, according to Bank of America analysts. Krylov estimates that the Russian treasury’s energy export revenues will climb to 862 billion rubles ($24.5 billion) this year thanks to the cheap ruble and expensive crude. Andrei Tsion, a financial analyst with Lionstone Investment Services Ltd., agrees that the state will benefit substantially. “Thanks to an increase in the treasury’s energy export revenues, it will be easier for the government to deal with the budget deficit and demonstrate an improvement in Russia's financial situation," Tsion said. Krylov said that the situation will not, however, solve all of Russia’s budget problems. “This unique situation will not help the budget deficit so long as we still have the budget rule that requires the oil exporters to surrender their profits above a certain cutoff point to the national Reserve Fund until the size of that fund reaches 7 percent of GDP,” said Mikhail Krylov. At the beginning of 2014, the size of the fund stood at only 4.3 percent of GDP. But there is a good reason for the budget rule: The oil industry’s windfall profits will help Russia to build up a safety cushion. Such a cushion helped Russia get through the 2008-2009 global financial crisis relatively unscathed. Additionally, by not allowing the windfall oil and gas export revenues to plug holes in the budget, the government will be forced by the budget rule to pursue much-needed reforms and find new ways of fostering growth. Russian consumers are the only group that stands to lose from a cheaper ruble. Car dealerships are already forecasting an increase of 10 percent in the average price of an imported car. Most foreign automakers with large sales in Russia are already assembling their cars in-country using Russian-made components, but some of the most expensive parts still have to be imported. Russian importers of consumer goods and alcohol also say they will have to raise their prices. Tour operators have been one of the first to react to the fall in the ruble exchange rate; it will now be more expensive for Russians to spend their holidays abroad.